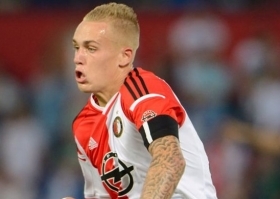 Feyenoord attacking midfielder Rick Kardsorp is one of the Netherlands' most highly rated young prospects. Karsdorp has come through the ranks at De Kuip and is now being considered for the Dutch full national team. The 19-year-old has only recently forced his way into Feyenoord's first team and this season many expect Kardsorp to show the talent that has been expected of him for some time. It is reported Ajax made a bid for the player back in the summer of 2013 but their offer was instantly rejected, a reported 5 million euros. Comfortable on the ball and an excellent passer, Kardsorp prefers playing in a more central attacking role or just up behind the lone striker. He made his debut on the 6th August 2014 against Turkish side Besiktas in a Champions League qualifier, coming on for the defensive midfielder Jordy Clasie in a 3-1 defeat. Arsenal and Chelsea have reportedly sent scouts to watch the youngster in action and Arsene Wenger is very impressed with what he has seen. If Karsdorp is to become an important player for his national side, Feyenoord will have to push him forward this season and he must play regularly domestically. The midfielder is certain to be an important member of his club's squad for the future.